Can Firewood be too Dry? What Was the Burn It Smart Program? Whatever your wood burning system, you can improve its efficiency and reduce air pollution by learning to burn correctly. The knowledge and skills needed to operate a wood burning system effectively need to be learned and practiced to get them right. Although it is not brain surgery or rocket science, it is not as simple as it might first appear. So, when you can light a fire with a single match and get a hot, bright fire burning in just a few minutes, you've accomplished something worth knowing and we salute the time and care you've taken. Reach around and pat yourself on the back. The water evaporates: Up to half the weight of a freshly cut log is water. After proper seasoning the water content is reduced to less than 20 per cent. As the wood is heated in the firebox, this water boils off, consuming heat energy in the process. The wetter the wood, the more heat energy is consumed. That is why wet firewood hisses and sizzles and is hard to burn while properly seasoned wood ignites and burns easily. The wood smokes: As the wood heats up, it starts to smoke. The smoke is a cloud of combustible gases and tar droplets. It will burn if the temperature is high enough and enough combustion air is supplied. When the smoke burns, it produces bright flames. If the smoke does not burn it will flow into the chimney where it will either condense as creosote or go outside as air pollution. Unburned smoke is a waste because it contains a large part of the total energy in the wood. The charcoal glows: As the fire progresses and most of the gases and tars have vaporized out of the wood, charcoal remains. Charcoal is almost pure carbon and burns with a red glow and very little flame or smoke. Charcoal is a good fuel that burns easily and cleanly if it is given enough air. Although charcoal combustion produces almost no smoke, the exhaust can have high concentrations of carbon monoxide, so it must be vented completely to outdoors. In reality, all three phases of wood combustion occur simultaneously because the wood gases can be flaming and the edges of the pieces can be glowing red as charcoal burns, while water in the core of the piece is still evaporating. The challenge in burning wood effectively is to boil off the water content quickly and make sure the smoke burns with bright flames before it leaves the firebox. The suggestions offered below are effective for the most common form of wood stove; the front loading, updraft, non-catalytic type. The techniques may or may not be suitable for catalytic stoves, or for cook stoves, furnaces and fireplaces. However, the principles are sound and if you need to use different techniques to get good results in your particular system, that is just part of the variety and charm of wood burning. seasoned firewood split into a range of piece sizes. The first step in building a fire is to find out where the combustion air enters the firebox. For most modern stoves and fireplaces with glass doors, much of the air enters the firebox through a narrow strip above and behind the glass panel. This "air wash" flows down across the glass to the front of the fire because it is cooler, denser and heavier than the combustion gases. Most stoves without a glass air wash system will have an air inlet near the bottom of the firebox, usually just inside the loading door. Some stoves have specialized air inlet systems that can affect lighting procedure. If you feel cold air when you open the stove loading door and reach inside, your chimney is in cold backdraft. If you go ahead and light the fire without correcting the backdraft, you will fill the house with smoke. You can neutralize the negative pressure that is driving the backdraft by opening the closest door or window to outdoors. Note that the cold backdraft is the result of a system design flaw: either an outside chimney or a chimney that penetrates the building envelope below its highest level. In extreme cases, these flaws can result in hot backdrafts that fill the house with smoke. If your system suffers cold backdrafts, please be aware that it is more than just a nuisance – it can be hazardous. By opening the nearest door or window, you are merely masking the problem and as soon as you close it, the negative pressure will again act on the system, tending to reduce the net chimney draft available to flow the exhaust up and out of the house. You can build a conventional fire by starting with newspaper and putting kindling on it and then larger pieces, but this method can lead to fires that collapse on themselves and smolder. It also tends to be smoky and fussy because you have to keep adding wood until you have a full fire. Here are three methods you will probably have more success with. 1. Two Parallel Logs. Put down two split logs with a space between them and put some twisted newspaper in the space. Add some fine kindling - one inch across or less - on the newspaper and more kindling of various sizes across the two logs. 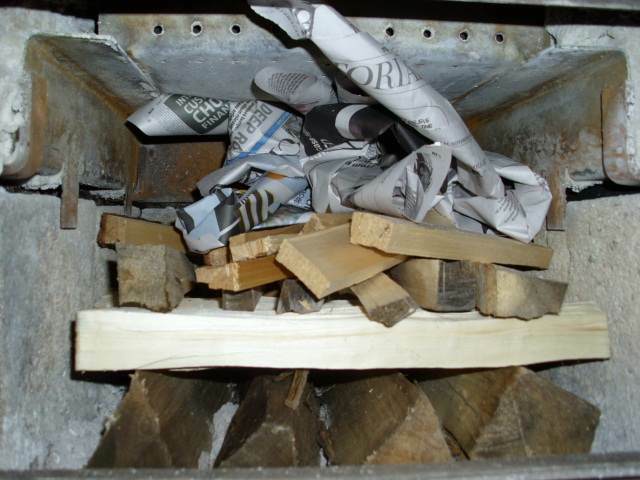 This method works well because the two logs give some space for the newspaper and kindling to get a good start. Their burning is usually enough to ignite the two larger logs. After the kindling has almost burned out, more wood must be added to make a full fire. A top down fire ready to light.2. Top-down. While this method takes a little getting used to, it is absolutely reliable, and when it is done properly there is almost no smoke right from the start. Just place three or four full-sized split logs on the firebox floor. Place several pieces of medium kindling across them. Then put 10 or so pieces of fine kindling on top. Now take four or five full sheets of newspaper and roll each one up corner-to-corner and tie a sloppy knot in it. Knotting the paper helps to keep it from rolling around as it burns. Place the knots on top of the fine kindling. Light the paper and watch as the fire burns down through the light kindling, the heavy kindling and into the bottom logs. Using the top-down method, you can light the paper and watch the fire burn on its own for up to two hours. 3. Using Fire Starters. Many people use fire starters made of sawdust and paraffin wax. You can buy commercial versions or make them yourself. You can even cut up a wax firelog to make your own starters. If the starters are placed among split pieces of dry wood, the fire will start reliably. The goal when lighting a wood fire is to achieve quick ignition of the load without fussing or waiting for it to catch. After practicing with these procedures a few times, you might be surprised at how quickly you can establish a bright, hot fire. Shown here is the newspaper on the bottom and kindling on top. The problem with this method is that as the newspaper burns away, the kindling falls and can smother the fire. The top down method is more reliable and burns cleaner. For most wood-burning appliances, the live coals that remain after the fire has burned down are found at the back of the firebox furthest from the air supply. Regular raking of coals to the front of the firebox means most of the ash accumulates just inside the door. If necessary, remove a small amount of ash from the front of the firebox before disturbing the remaining charcoal. Now rake the live coals forward to just inside the loading door. If only a small amount of charcoal remains, you will have to start with kindling. If you have a good quantity of glowing charcoal to work with, place at least three, and preferably more than five pieces of firewood on and behind the charcoal. Open the air inlets fully and close the door. Remove ash from front of firebox. Rake the coals forward. Place firewood on and behind the coals. If everything is just right, you should expect almost instant ignition of the new load. Allow the fire to burn with bright turbulent flames until the firebox is full of flames and the wood is charred. This usually takes between 5 and 15 minutes, depending on the size of the pieces and the moisture content of the wood. When the firebox is full of flames and the wood is charred, you can begin to reduce the air setting to produce the amount of heat and length of burn you desire. You may want to try reducing the air control setting in two or three stages. The result will be less air pollution because the fire will not have to recover from the single, large reduction in air supply. The most important rule is NEVER LET THE FIRE SMOLDER. As long as there is solid wood in the firebox, there must be flames or the smoke will escape unburned, both reducing efficiency and increasing pollution. With modern appliances, it is possible to achieve a reliable overnight burn while maintaining flaming combustion and having enough charcoal in the morning to rekindle a new load. Fuel load geometry: Small pieces of firewood arranged loosely in a crisscross pattern burn quickly because the combustion air can reach all the pieces at once. Larger pieces placed compactly burn more slowly because there are fewer spaces where the air can penetrate the load. Never add just one or two pieces of wood to a fire. Three or more pieces are needed to form a sheltered pocket of glowing coals that reflect heat toward each other and sustain the fire. Good for short or "flash" fires. Fire in cycles: Don't expect perfectly steady heat output from the fire. Wood fires burn best in cycles. A cycle is the time between the ignition of a load from charcoal and the consumption of the load back to a coal bed. Each cycle should provide between four and eight hours of heating, depending on how much wood was used and how much heat is needed. Plan the firing cycles around your household routine. If someone is home to tend the fire, use a short firing cycle. If you must be away from the house during the day, use the extended firing cycle. Use a few relatively small pieces of wood for short fires to "take the chill off." Load the wood loosely in a crisscross arrangement. Let the fire burn brightly until most of the solid wood is burned before reducing the air setting. Flash fires are effective in spring and fall when the heating load is modest. Using the flash fire technique, you can avoid smoldering fires. A flash fire.The flash fire is a small amount of wood burned quickly. Use it in spring and fall when you just want to take the chill off the house. The flash fire technique eliminates the smoldering fires that are common in spring and fall. To build a flash fire, rake the charcoal towards the air inlets and place several small pieces on and behind it. The pieces should be stacked loosely in a crisscross arrangement. Open the air inlet to produce a hot, bright fire. The air supply can be reduced slightly as the fire progresses, but never enough to extinguish the flames. When only charcoal remains, the air supply can be reduced further to prevent cooling the coal bed. To achieve a longer-lasting fire, rake the coals towards the air inlets and use larger pieces of wood placed compactly in the firebox. Placing the pieces close together prevents the heat and flame from penetrating the load and saves the buried pieces for later in the burn cycle. Open the air inlets fully for 5 to 15 minutes depending on load size and fuel moisture content. When the firebox is full of flame and the outer pieces have a thick layer of charcoal, begin to reduce the air control in stages to the desired level. The charcoal layer insulates the rest of the wood and slows down the release of combustible gases. This allows you to turn down the air control and still maintain a bright, clean-burning fire. Use the extended fire technique to achieve an overnight burn or a fire to last the day while you are at work. The goal is to maintain flaming combustion until the wood is reduced to charcoal. When you follow the suggestions for raking of the coal bed, you will find that ashes accumulate at the front of the firebox, just inside the loading door. These ashes can be removed easily before coal bed raking in preparation for loading. The best time to remove ash is in the morning after an overnight burn. There will be some heat left in the firebox and chimney, producing enough draft to draw ash dust back into the firebox if you shovel carefully and hold the bucket in the firebox opening. Remove a small amount of ash about every other day of full time 24 hour heating in cold weather. If there are firebricks in the firebox, they should be tan in color, never black. Steel or cast iron parts in the firebox should be light to dark brown, never black and shiny. With seasoned wood, correct air settings and proper loading arrangement you should expect almost instant ignition of a new load of wood - a long delay before ignitions indicates that something is wrong. If the appliance has a glass door without air wash, it will be hazy, but should never be totally black.